I was thrilled to be nominated by Lizzy at The Ropes in London for a Liebster Award, so thank you! I’ve been blogging for about nine months and it’s become my saviour. I work erratic shifts in my full-time job which leave me exhausted a lot of the time, so finding time to blog is hard, but I love it. 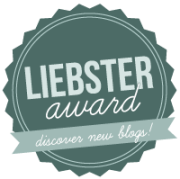 The Liebster Award is a fun way to recognise and promote new up and coming blogs of a good standard with less than 200 followers (on WordPress). Liebster comes from the German word for ‘dearest’ or ‘favourite’, which is cute. 1. Thank the Liebster Blog presenter who nominated you and link back to their blog. 2. Post 11 facts about themselves, answer the 11 questions they’ve been asked and create 11 questions for your nominees. 3. Nominate 11 blogs of 200 followers or less who you feel deserve to be noticed and leave a comment on their blog letting them know they have been chosen. 4. Display the Liebster Award logo (there’s two of ’em). 1) I was born, brought up and live in South London, went to university in North London, spent most of my working life based in West London and have often partied/ate/shopped in Central and East London so I like to think I have a good, balanced knowledge of the whole capital. 2) I’m an adrenalin junkie – I’ve done two skydives, a bunjee jump, a trapeze lesson, abseiling and a parachute jump off a mountain. 3) I have travelled to over 40 countries, although as I get older and obtain more financial responsibilities, my goal of visiting 100 before I die seems a bit optimistic. 4) I make a mean Mojito – taught myself the recipe after drinking a lot in Cuba. Do NOT grind up the mint leaves! 5) I hate winter and the cold, I was born in August so I would prefer to be in the warm all year round. 6) I was a camp counsellor in New Jersey when I was 19. It was quite possibly the hardest job I have ever done in my life. I didn’t sleep for the best part of three months while looking after seven seven-year-olds 24 hours a day. 7) I published a book in 2007 – a biography of a pop act. Not what I dreamt my first book would be, but I am proud of it. 8) I’ve been a pescatarian since I was eight. 10) If money was no object, I would love to buy National Trust ‘at risk’ properties and restore them. 11) I try to live by the slogan ‘Do it, move it, make it happen – no one ever sat their way to success’ – although I am guilty of not always applying it to my life. 1. Which is your favourite month and why? August. It’s my birthday month and tends to be warm. 2. What is your single, most important possession? 3. Describe your very first memory? Sitting on Father Christmas’s lap at daycare when I was three. I was very self-conscious of being stared at. 5. If you could only visit one city in the world, which would it be? 6. Facebook, Twitter or both? 7. What would you choose for your last meal? Lobster with garlic butter with buttery mashed potatoes and spinach and sultanas on the side. 8. What made you decide to start your own blog? After years of being the ‘go to’ girl for London information from friends and family, I thought it was time put it down in writing in the run-up to the Queen’s Jubilee. 9. What is your favourite film? 10. Who do you think is the world’s most loved celeb? 11. What is the last song you listened to? And here’s 11 other blogs and 11 other questions. 1) What’s your favourite (non-blog) website? 2) Given the choice, what holiday would you prefer – city break, beach break or adventure holiday? 3) Is there any world city you found disappointing or underwhelming when you visited it? 4) What’s your favourite book? 5) What epitaph would you have written on your gravestone? 6) What is your favourite dessert? 7) What is your ‘guilty pleasure’ TV show or film? 8) If you could time travel to any decade in the 20th century, what would it be? 9) If any Hollywood star, dead or alive, could play you in a movie of your life, who would it be? 10) First record/cassette/CD/download single you ever bought [depending on your age ;-)]? Posted on 27 Feb 2013, in London and tagged bloggers, blogging, London. Bookmark the permalink. 2 Comments. Back to the Future! I love that too! Really need to watch it again actually.